Two years ago Markel Kidd was a high school dropout. Growing up in Los Angeles’ South Central neighborhood, Markel says it was all too easy to get caught up in the gangs, violence and drugs that were a way of life. When entering high school his thoughts focused on how to sell and buy drugs rather than studying for tests or joining the football team. Today, 19-year-old Markel, not only has his high school diploma but is a student at Crimson Technical College in the Aviation Technician Program receiving As and Bs and on track to graduate early next year. 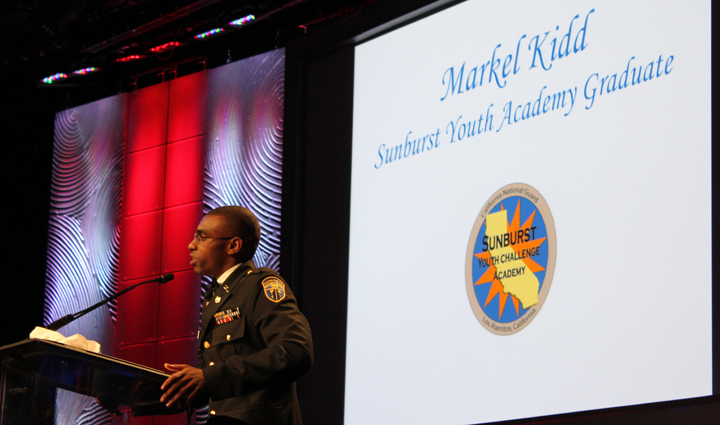 Thanks to Sunburst Youth Academy, an organization dedicated to helping at-risk youth attain their GED or high school diploma while also teaching life, job and leadership skills, about 800 students like Markel graduate high school every year. Sunburst Youth Academy, located just outside of Los Angeles, is one of two California academies that serve the entire state. “The National Guard Youth ChalleNGe Program gives young people – particularly at-risk teens – the chance to empower themselves through education. Our emphasis on reversing the high school dropout crisis is part of a broader effort to help adolescents reach their full potential, backed by the resources provided by ChalleNGe and additional post-graduation opportunities provided by the National Guard Youth Foundation,” says Lou Cabrera, president of the National Guard Youth Foundation. Kidd is one of the featured speakers for the second annual California ChalleNGe Champions Gala, which was held Saturday, October 19 at the Beverly Hilton Hotel in Beverly Hills. The annual gathering pays tribute to the California National Guard’s efforts to curb high school dropout rates through its evidence-based, cost-effective Youth ChalleNGe Program and the members of the community who support the program. “Our at-risk youth deserve a second chance,” says U.S. Rep. Grace Napolitano, D-Calif., co-chair of the Congressional Youth ChalleNGe Caucus.